Guess what! I finally finished Silas Marner. And I don't feel like I was missing out on anything by waiting until I was in my thirties to read it. It's a nice little story, but I don't know if I'm missing a bunch of subtext and hidden meaning, or what, it just really didn't do much for me. But, the good news is that I can finally get to some of the other books on my to be read list. Here's what I'm hoping to read this month. Child 44 by Tom Rob Smith. If this looks familiar, it's because it was on my to be read list last September. I really want to watch the movie on Netflix, but not until I read the book, so fingers crossed, it's going to happen this month. An Ordinary Man by Paul Rusesabagina is also a repeat. It was on my list in October of 2015. But now that I've finally finished We Wish to Inform You... I really want to read Paul's story. He's the gentleman that Hotel Rwanda was based on. He did amazing things that he viewed as just doing the right thing. The Gifts of Imperfection by Brene Brown was scrounged up at Goodwill. I've listened to some TED Talks Brown has done and an interview here and there, so I'm excited to read this one. So what's on your reading list this month? 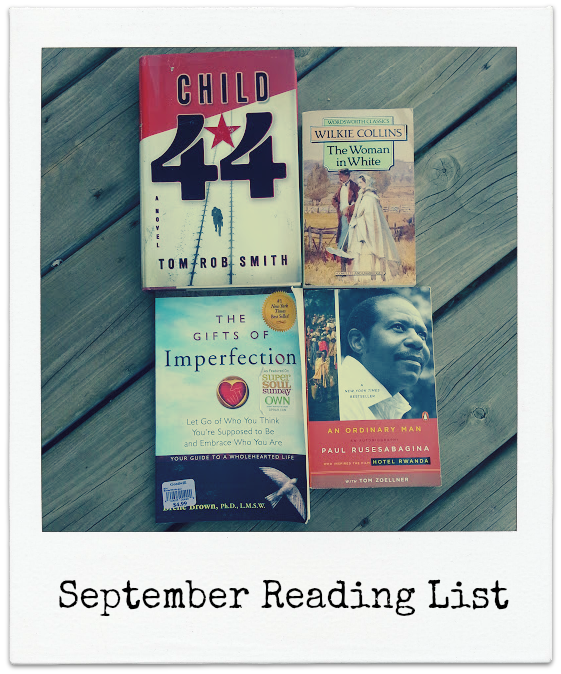 Or did you read something good last month? Let me know! Well that's good to hear. Makes me more anxious to read it! Good to hear Kay! I have The Moonstone also so if this one doesn't cut it for me, at least I'll have a reason to try that one.